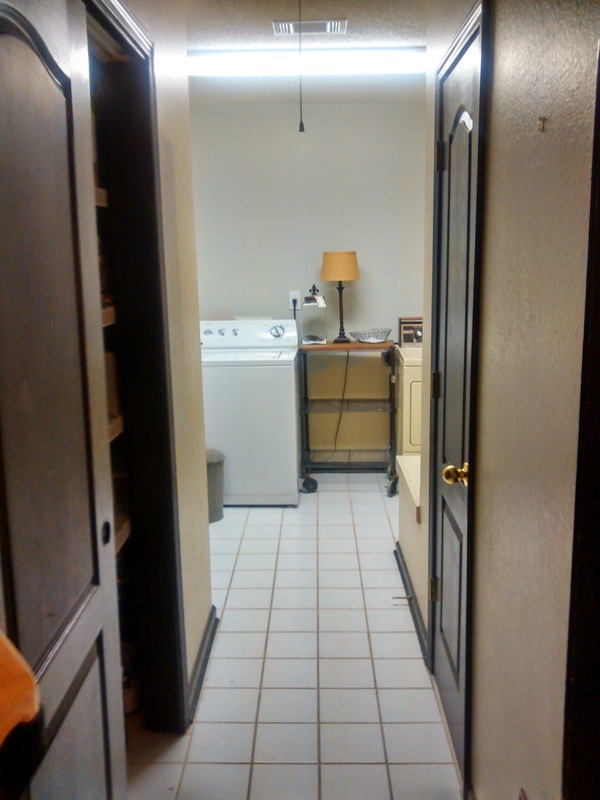 Laundry Room-Update - Oak House Design Co. The best laid plans...always seem to go awry. 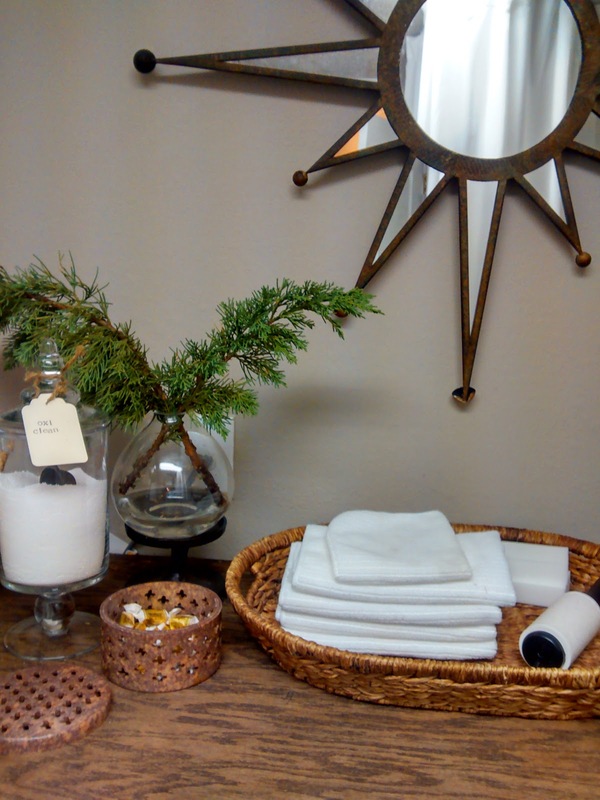 Several months ago, I shared plans for my laundry room. The washer and dryer were delivered, but I wasn't able to move forward with the other parts of the plan. Then you know what happens when you have family coming in town...you feel the urgent need to fluff the house, and finish all the projects you started. So when my sister called to tell me she was coming to town with friends, I decided, "Now is the time to finish ALL the projects!' Well, not quite all, but I did get a few done. The view is so much better. First off, I wanted to lighten the space. I went with Behr Ultra Pure White off the shelf in a gloss finish for the trim and doors. That alone brightened up the hall. The dark trim just didn't work in this space with the fluorescent lighting and no windows. For the walls, I chose SW Amazing Gray, only when I put it up, it read more like a beige over by the pantry doors, but I still like it. It's a good neutral. As you can see the floors remain, but the neutrals coordinate better. 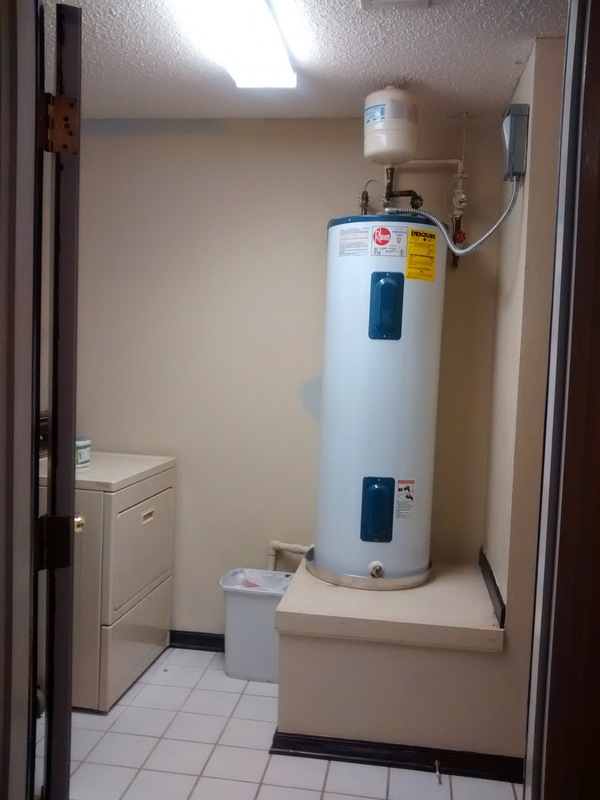 Next up, I wanted to hide the water heater. I used the Ikea KVARTAL track system and mounted it to the ceiling. Then I hung simple, white drapes I found on clearance at Target a year ago. 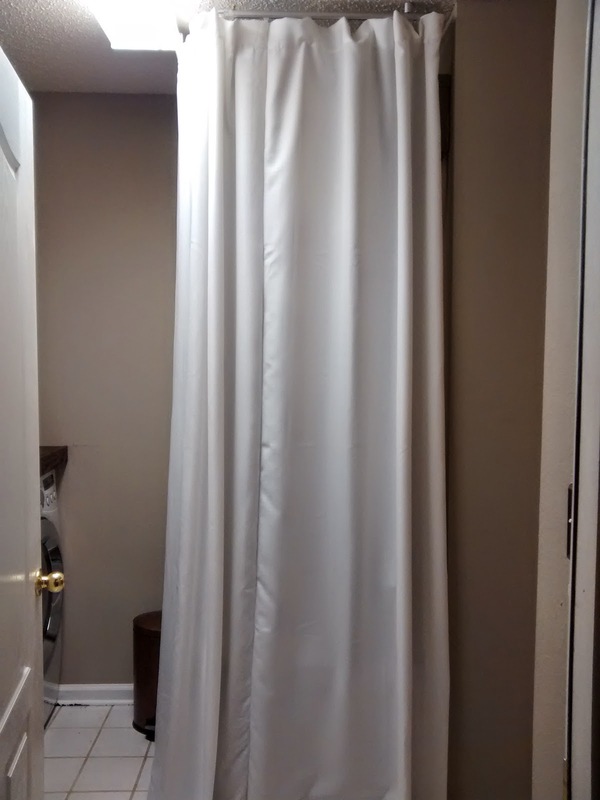 I told my sister it kind of looks like a shower, but better than the water heater, I hope. The final goal for the space was/is to add storage and folding space. I went and got a nice piece of oak plywood cut at the Home Depot for the countertop, brought it home and REALIZED I MEASURED WRONG! I am sure I have precise measurements and drawings stashed away somewhere, but in my haste to get this project done, I took the depth measurement from only one machine, forgetting that the dryer stuck out further from the wall to allow for the vent pipe. *Sigh* So after I gave myself a time-out to avoid crying, I devised a plan to cover my tracks. In the end, I realized I couldn't permanently install the countertop yet anyway, because it will be impossible to install the cabinets, which is the remaining major item to be checked off the list. In the interim, I am enjoying using this new space, especially the countertop. I've had my new washer and dryer for about 4 months and I am loving them. I had read reviews talking about the mildew smell that front loading washers can get, but so far I haven't had any problems. They do have more upkeep than a standard washer, because you are supposed to wipe down the seals after each use, and drain the line at the base of the washer once a month. But for me, gaining all of that counter space is worth the extra bit of upkeep. Very nice! I like the makeover. Thanks Jae! It's one of those things that has taken a long time to get to, but I'm so happy that changes are being made.